Boltraffio has been identified as the Giannantonio whom Leonardo da Vinci mentioned in a document of 1491 (Institut de France, Paris), which states that Boltraffio gave him a silverpoint drawing. From a wealthy family, Boltraffio was among the pupils of Leonardo mentioned by Vasari. His oeuvre has been reconstructed on the basis of similarities and parallels as he did not sign his works and only three documented projects are known. His early works reveal the influence of Vincenzo Foppa and Bernardo Zenale and his later ones that of Bramantino and of his teacher Leonardo. Boltraffio executed religious compositions but was particularly esteemed and successful as a portraitist, a genre in which his production was outstanding. One of his surviving documented compositions, mentioned by Vasari, is dated after 1500: this is the Pala Casio, painted for Santa Maria della Misericordia in Bologna, now in the Musée du Louvre. In this work the seated Virgin and Child are framed by Saint John the Baptist and Saint Sebastian, with two donors. The composition was an important reference point for Suida who used it to attribute the present panel to the artist. The present portrait was in the collection of Count Febo Borromeo in Milan in 1932 when it was published by Berenson and included in his catalogue of the artist’s oeuvre. From there it passed to the Mercuria gallery in Lucerne, from where it was acquired for the Thyssen-Bornemisza collection in October 1934, appearing in the catalogues of the Collection from 1937. In 1935, following its acquisition, it was cleaned and various areas of old repainting removed. These had concealed the eye on a stick held by the young woman which relates her to Saint Lucy, possibly her patron saint. Boltraffio was inspired by Leonardo’s Belle Ferronière, albeit interpreting that model with considerable freedom. The present sitter emerges like Leonardo’s from the darkness but is more frontal than the Belle Ferronière. The light particularly emphasises her face, neck and breast, creating soft shadows such as those on the nose and left cheekbone, which become much darker and denser on her neck. Boltraffio gave this sitter very large eyes that look out at the spectator and a gentle smile, just visible at the edges of her mouth. 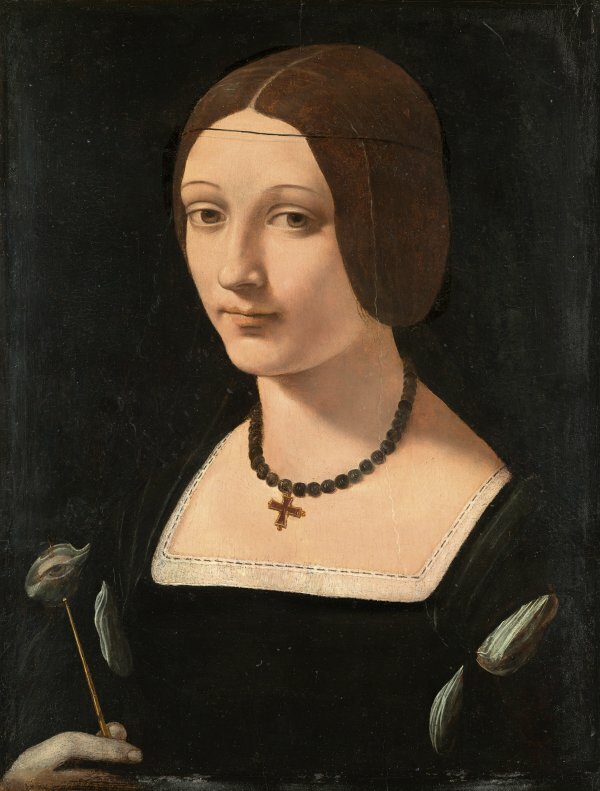 It has been suggested that this painting is the one mentioned in a text by Lancino Curzio, which describes a portrait by Boltraffio of a beautiful young woman named Lucia. The description in that text, however, does not convincingly correspond to the present work. Among portraits attributed to Boltraffio is one in the Pushkin Museum in Moscow in which the artist again depicted a real person as a saint, in that case an idealised young man presented as Saint Sebastian. With his soft features and long hair, he has a thin gold halo and wears a delicate gold crown with an ear of corn in the centre. The present Portrait of a Lady as Saint Lucy has been dated to the end of the first decade of the 16th century by Maria Teresa Fiorio.